"I'm using…a Bad Horsey Wah-Wah, which is a Morley that I helped design," says Steve Vai about his Morley Steve Vai Bad Horsie 2 Contour Wah Pedal. At 12:17 of this rig rundown the Morley Steve Vai Bad Horsie 2 Contour Wah Pedal is show on the pedal board of Ryan Roxie of [Slash's Snakepit](http://equipboard.com/band/slash-s-snakepit). The Morley Steve Vai Bad Horsie Wah Pedal is set to Steve's precise specs and equipped with Morley's superior electro-optical circuitry to handle the heavy wah. This effects pedal is switchless for easy use. "My main touring rig that I've put together is pretty cool and is capable of doing a lot of stuff. Basically what I'm running is this: MJ Mirage Guitar through: –ErnieBall Volume pedal –Digitech Wammy pedal –Morley Bad Horsie 2 Wah pedal…"
"my use of it can vary from track to track. I'm using it quite a lot on the song Tender for sweeping effects with yhe delays." This can be seen around 3:44. Travis says that he had previously used a Bad Horsie 2 Wah pedal when he used a pedalboard setup. At 0:27 you can see Tyler displaying the Morley Bad Horsie 2 wah pedal. You can see it in the chain of wah pedals in the video when he displays them. Used in the video. Also mentioned in description. 0:29 - In a 2016 BIGBOSS Clinic at Ochanomizu, Japan, Syu can be seen demonstrating a pedalboard with 3 different Boss Overdrive pedals, a Digitech Whammy pedal and a Waza Craft Delay pedal. 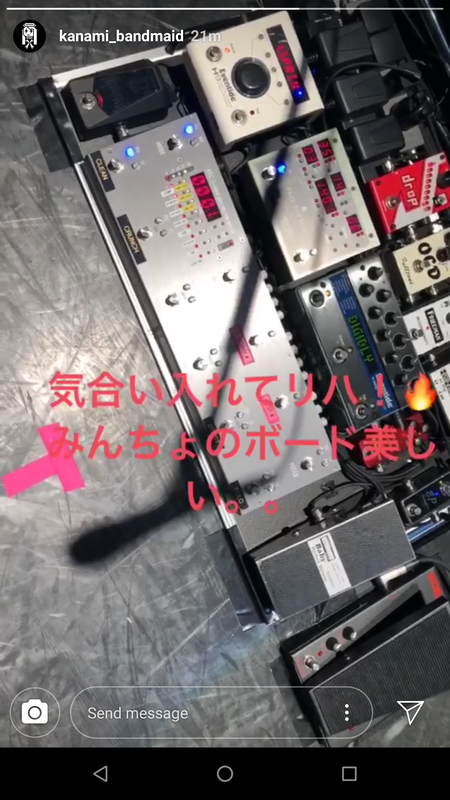 11:02 - Syu's second pedalboard can be seen, in which he utilizes a Morley Steve Vai Wah, Digitech Whammy DT and an ISP Decimator noise gate. "My go to Wah - has been since 2008"
10:20 - Bryan's only effect pedal is a Morley Bad Horsie wah. It's great except for that is sounds slightly differant than any other wah, it sounds more robotic and less of a human touch sound. This thing is built like a tank, and I especially love how it auto-engages when you step on it! So you don't have to press it all the way down to hit the button first. Best pedal ever its my go to pedal. Fantastic pedal. Love it hard. 2 whawha in one. It got such a wide range! Anyway, as for the review.. I love it! I wasn't sure about it at first, but the switch-less (contour Wah switch is to activate the knobs, which lets you dial in your preferred sound) design is really innovative. The knobs and switch are cool and all, but in the grand scheme, it doesn't compare to not needing to go forward and down on the stomp switch with the pedal to deactivate it (like a Dunlop Crybaby Wah). It has come to replace both of my crybabies in two short weeks. Cool pedal, give her a try! If you´re looking for that sounds, standards*. This is not for you, this pedal need some sofisticated-hands instincts to work natural. But sounds brillant when you got the goal. The adding of a contour button make a plus on your sound, like 2 whas... This one is agressive! best wah i have ever used. love this thing, step on step off is so handy, contour wah lets you have two distinct way tones in one pedal. got it for a steal and I had to make space but it was totally worth it. Whenever I see someone with a CryBaby anymore, all I think is 'you fool'. Great tone, great build, best sweep and handiest use on the market, hands down.